After studying International Business Administration with the diploma topic "The Internet as a Sales Channel" in 1997, the professional focus quickly became clear. After a "classic" industry entry at Beiersdorf, followed in 2000 his first startup in the "New Economy Time". In record-breaking 12 months "from hero to zero" the first drastic "fail'n learn" experience was made. This was followed by stations at Microsoft, Deutsche Telekom and Sony. Here always as a producer and advocate of the customer's view on digital products and business models. This was followed by a longer station as CPO and then CTO at Ticketonline / CTS Eventim AG in the ticketing area. 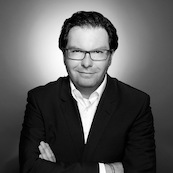 After 3 years as a freelancer in e-commerce with major change projects at Breuninger, Otto Group, Hagebau, Bertelsmann, the current station followed as Chief Digital Officer. After the first year as a pure Transformer, he brought about a "reverse take-over" and today, in addition to digital transformation, is responsible for all IT and all other digital topics such as data, e-commerce and ticketing at Deutsche Messe AG. Through his broad range of experience and roles from all sizes of companies - from start-up to medium-sized companies, entrepreneurs, freelancers and top executives - his passion for New Work came up with the question of which skills and competencies do employees need today and which leadership and organizational models are necessary to be prepared for the future of work with ever greater complexity and uncertainty. Michael Mollath is a confessed HSV fan and avid golfer.